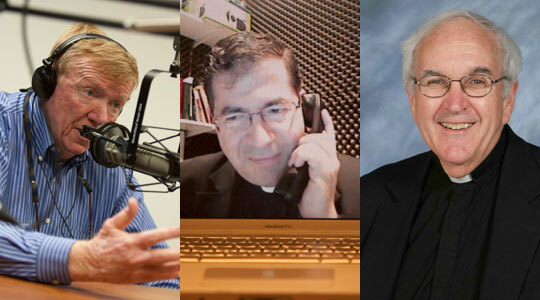 A summary of today’s show: On Memorial Day, Scot talks with Beirne Lovely about his experience as a Marine serving in Vietnam and as a veteran on Memorial Day; with Fr. Frank Pavone about the ministry of Priests for Life and this weekend’s appearance at St. Paul, Hingham; and Fr. Stephen Rock, a 34-year Navy chaplain and now pastor of St. Agnes, Reading. 1st segment: Scot welcomes Beirne Lovely, general counsel for the archdiocese and a former Marine, to the show. Scot asked him about his military service. He was commissioned as a Marine officer directly from Dartmouth College in 1967, followed by six months in Marine officer training, and then directly to Vietnam. He was stationed there for 13 months, all of 1968, which was one of the worst years of the war, including the Tet Offensive. He spent his whole tour up north, including a Khe Sanh and the DMZ. He was very close to the North Vietnamese border, serving as a platoon commander in an infantry company. He became a company commander when his company commander was killed. Scot said his perception of the Marines is that they are the ones who go in first, taking on the most difficult and most life-threatening assignments. Beirne said that was true. The Marine Corps had responsibility for the northern region of South Vietnam so they primarily were facing uniformed, trained North Vietnamese Army soldiers rather than Viet Cong guerillas, so that’s a fair statement. Beirne has been out of active duty with the Marines for 40 years now. What’s it like to be a veteran on Memorial Day, remembering all those who have served and given their lives? Beirne said he lost a lot of friends in Vietnams. He arrived in Vietnam on an airplane with about 40 infantry Second Lieutenants and of those about half were killed and virtually all of the rest were wounded, so he has a special memory of service. He spends Memorial Day with other veterans in his hometown of Milton, which has services of recognition of veterans. He’s spoken at a number of memorial services. He stays in touch with them year-round. He belongs to a number of veteran organizations to gather and recall the services of others. It’s a difficult day in some respects because it reminds him of the friends he’s lost as well as the people who served with and under him who were killed. He remains close to a small cadre of friends who he survived with and periodically they gather. Every year they celebrate the Marine Corps birthday on November 10. Boston is famous for its Marine Corps birthday recognition. They have a Marine Corps luncheon with over 2000 at the Hynes Convention Center. It’s the biggest gathering of Marines in the country and often the Commandant or the assistant commandant come and speak. They have a number of Medal of Honor winners who are present. Msgr. John McDonough, a priest of Boston and former Chief of Chaplains for the Air Force (who Scot and Beirne jokingly call “the General”) and Fr. Rich Erikson, the vicar general of the Archdiocese and reserve Air Force chaplain, have attended the last couple of years with Beirne. Scot asked Beirne about the message he often delivers about the debt we all owe to those who are willing to give their lives in service to their country, particularly those who have lost their lives. The principle message he tries to send is one of respect and thanks and admiration for those who have served. This past week was recently Armed Forces Day, which honors everyone, living and dead, who have served. Memorial Day is a special time to remember those who have given the ultimate sacrifice. When he talks to young people, many of them have no idea of this reality and have not experienced this and hopefully never will. But given Iraq and Afghanistan, people are more cognizant. He tries to make them understand that people can have a special calling and sometimes we have to do what we don’t like to do. No one likes war, but someone has to fight it. Scot said Beirne served in a time when the respect for the military was low during the War in Vietnam. Beirne said during his last parade at Dartmouth College before graduating, they had to move to the stadium because there were so many protesters. He remembers having eggs thrown at him. Coming back from Vietnam, he recalls spitting at him or looking the other way or yelling at him. Quite a different experience than what troops experience today. He doesn’t hesitate to say that he thinks Vietnam was a mistake, but when one is serving in the Armed Forces, you don’t challenge your superiors, from the President on down. Scot said we may face some of the same issues today where some don’t agree with the wars in Iraq and Afghanistan, which can lead to an attitude towards men and women in uniform. It seems to have gotten better, but Scot’s not sure that we still show proper appreciation for those who offer their lives in protection of our country. What’s Beirne’s sense of how we as a society, particularly in Massachusetts, appreciate our servicemen and women? He thinks we’re getting much better at it. He thinks veterans are being accorded the respect that they’re due. It’s painful for him to watch. He wasn’t a big supporter of what we did in Iraq or the strategy in Afghanistan. It’s difficult to conceive how the war will be “won”. He has friends, whose children are in the service and going back for their third, fourth, or even fifth tours. In a sense, you’re waiting for the bubble to burst. Vietnam was somewhat similar. Beirne was at Khe Sanh for 100 days. It was a famous base in a valley that was ill-situated. He remembers taking patrols out every day for 100 days and running into small-arms contact every day without exception and forcing his troops to walk through the densest of brush. Today, the young people are forced to drive on roads which they don’t have complete control over and there’s no way to combat the improved explosive devices (IED). One of Beirne’s jobs, his hardest, was when he came back from Vietnam. He was assigned to Newport naval base as executive officer of the Marine barracks over a couple hundred Marines. His job every fourth day was to make casualty calls to families of Marines who had lost a loved one. He probably did 100 of those over 3-1/2 years. That was the most painful task. There’s nothing worse than knocking on the front the door and telling a mother her son is dead. Scot said, they know as soon as they see you. It’s a very quick notification in the sense that you have to get it out: “Mr Lovely, I’m sorry to tell you that your son, Charles, was killed two days ago in the Republic of Vietnam serving his country.” It just doesn’t get any worse than that. After the notification it was his job to follow through and handle the funeral and coordinate the military honors at the funeral. Of all the things that bring him tears, he’s not ashamed to say it, is thinking about those people who gave their lives. Scot said, both for our Catholic and non-Catholic listeners, Memorial Day takes on an air of “what cookout are you going to?” using the language of celebration, not thinking of how difficult it is for someone who’s made 100 of those calls and lost so many friends. What suggestion does Beirne have for everyone, but especially Catholics? Beirne said he was not the most devout and faithful Catholic when he finished college. But he remembers in Vietnam the role of the chaplain. At Khe Sanh, you had to stay in a trench all the time. They were taking 2,500 rounds per day of heavy artillery. These chaplains were notoriously visible, which gave him a great deal of comfort. His message to people is to pause some time during the day to think about those who have worn the uniform and have made the ultimate sacrifice for their God and their country from their perspective. Scot would add to that to pray for the souls of the faithful departed, particularly those who have served in the military. Something we’re very good at in the Church is remembering those who have gone before us. If you happen to encounter someone you know has served, thank them for their service, however short or long it is. 2nd segment: Scot welcomes Bill Wise and Fr. Frank Pavone to show. Scot asked Fr. Frank to describe Priests for Life’s ministries. He said this is the group’s 20th year. They help priests to be more clear, articulate, and effective in proclaiming the Gospel of Life, counseling those who may be tempted to abort, helping those who have had abortions to find forgiveness and peace. Their ministry goes beyond what priests are called to do. Priests for Life ministers to the whole pro-life movement, training laypeople in the spirituality of being pro-life, how to defend life; ministering directly to those who’ve had abortions, via Rachel’s Vineyard; operating the Silent No More campaign, in which men and women who’ve lost children to abortion share their testimony publicly; reaching out to people to exercise their political responsibilities consistent with the Church’s teachings; reaching out to African-Americans, led by Dr. Alveda King, niece of Dr. Martin Luther King; and more. Scot asked Fr. Frank what image does he hope that Catholics in the pro-life movement portray. He said the secular media is always trying to portray the extremists, but that isn’t what we are as Catholics. Fr. Frank points out that this is a movement that is positive and one of inclusion. It goes against the “Roe v. Wade” decision, which said that the word “person” does not include the unborn. The pro-life view has open arms, welcoming and nurturing all human life. We say to the society, what Jesus says to us: “I am with you.” I do not condemn you. I want to help you to say yes to life, to find solutions to your problems. Scot recalled that Marianne Luthin, pro-life director for the Archdiocese, described Boston’s Project Rachel retreats and how they bring healing to women who’ve suffered abortion. He said the Rachel’s Vineyard ministry does the same thing. It’s important for us to share that it’s important to help people both before and after abortion. Fr. Frank said the pro-life movement is a pro-woman movement. Pope John Paul said the pro-life stance is a stance in solidarity with the woman. We say that very clearly. We don’t say, Let’s love the baby and forget about the mother. They sometimes counsel women who’ve had as many as 25 abortions. Someone who’s gone through something like that and is reconciled to the Church, then other people can say that there’s hope for them, even for those involved in other sins. Scot said St. Paul’s parish has asked Fr. Frank to speak at all the Masses and lead an evening discussion on June 4 and 5. Bill Wise said he and his wife attended a conference of Catholic CEOs in Naples, Florida, through Legatus. He and his wife knew Fr. Frank from other events, including the National Prayer Breakfast in DC. Fr. Frank had said at the time that he’d met Cardinal Seán last January and how he was so supportive of his ministries. Bill said he was moved by the Holy Spirit to invite Fr. Frank to Hingham. Fr. James Rafferty, the pastor of the parish, graciously extended his invitation and the pro-life committee organized the event. Fr. Frank was grateful for the invitation and that there was a weekend relatively soon to come visit. He said anyone who wants him or any of the priests who work with him to visit their parish are welcome to contact Priests for Life. There are six priests from various parts of the country who do this work full-time. On Saturday, June 4, 7pm-9pm, Fr. Frank will give an encouragement and signs of progress and victory in the pro-life movement together with a look forward to some key projects and opportunities in the months to come. Then he will listen to the people to hear their impressions, their questions, their concerns. He wants them to feel they got exactly what they need to take the next steps in their ministry. Fr. Frank said it’s been at least five years since he’s been in the Boston area. Scot asked Bill how many people can be accommodated at St. Paul’s for this gathering. Bill said they are prepared to welcome anyone who comes. He said they will see a good representation of the youth of the parish on Saturday night as well. Fr. Frank will be preaching at the 4pm vigil Mass on Saturday and then at the 7am, 9am, and 11am Masses on Sunday. The Saturday night gathering will be tentatively in the St. Paul School hall, or in the church if they need more room. Scot made the point that Priests for Life is not just for priests, but for everyone. Fr. Frank agreed and said the group is there to serve both clergy and laity. Much of their work is directed to people in the pews and people of other denominations as well. This is a matter of life itself and there’s nothing more fundamental than that. 3rd segment: Scot welcomes Fr. Rock to show. He’s pastor of St. Agnes in Reading and a former Navy, Marine, and Coast Guard chaplain. Scot said he’s retired as a military chaplain and asked him about the assignments he’s had as a Navy chaplain. Fr. Rock said he served for 34 years, the first 13 in the Reserves and the rest on active duty. He served with the Marines in Okinawa, Japan; on board the USS Long Beach out of San Diego, (which was built in Quincy); Camp LeJeune, North Carolina, with the Marines; and then Naval Air Station Sigonella in Sicily, Italy. From there he was called back to Washington to serve as personnel director for chaplains serving the Navy, Marines, and Coast Guard. Scot asked how many Navy chaplains are there? Fr. Rock said there were 1,100 chaplains around the world, 235 of them active duty priests. That was at the time he left he job in 1996. As he understands it now, there are less than 100 priests on active duty. After that job, he assigned himself to the USS Theodore Roosevelt out of Norfolk, Virginia, an aircraft carrier with 5,000 sailors and Marines on board. From there he went back to the Marines in Okinawa and then around the world again to Naples, Italy, which gave him an opportunity to be in Rome on several occasions. For his last assignment, he returned to New England for the Coast Guard Academy in New London, Connecticut. He spent 3 great years with those young men and women. Scot asked him what attracted to being a naval chaplain when he was in the seminary. Fr. Rock said his father had a cousin who was a chaplain with the Army Air Corp in World War II and he’s sure he heard some of those stories growing up. Also growing up in Boston, he had a great love of the ocean and stories of naval history here. He wanted to be a priest in conjunction with serving the country and traveling and seeing the world. Scot asked what it was like to be a chaplain on the Roosevelt, how it’s different from being pastor of a large parish in Reading. Fr. Rock said he was the senior chaplain on the ship with two Protestant chaplains who served under him along with a couple of enlisted personnel. Their role was to provide not only for the religious needs of the men and women onboard, but also the personal needs that are the equivalent of social work. They would handle all the Red Cross messages from the US regarding a death in the family or issues back home. They became pastors for the whole trip. The difference between being a chaplain on the ship and a pastor in a parish is just the uniform. In the parish he has the collar on and on the ship he has the uniform on. Some of the sailors would refer to him as “Captain” (his rank), but most would call him “Chaps” or “Padre” or “Father”. It was always a sign of endearment. He wasn’t into the rank. He remembers a sailor telling another, “Don’t worry about his rank. He couldn’t care less about it. He’s more interested in being with us.” Fr. Rock saw that as the ultimate compliment. His responsibilities as a chaplain extended beyond the Catholics. Fr. Rock said chaplains are responsible to provide religious opportunities for everyone. So of course he would celebrate the Masses, which occurred on the Roosevelt on Saturday night, Sunday morning, and Sunday afternoon. He would also helicopter to other ships in the carrier’s task force. There was no Jewish chaplain so he would work with the Jewish community onboard to prepare lay-led services. Before they would deploy, he would connect one of them with a local rabbi for training. They would do the same for all the other faith groups as well. Scot asked if there were big difference between serving with the Navy versus serving with the Marines and serving with the Coast Guard. Fr. Rock said that one interesting difference is that there were more Catholic Marines than there were Catholic sailors. He’s heard different explanations, but he doesn’t know how to explain it. He said there’s a deep desire in people for a better understanding of God, and who more than those putting themselves in harm’s way. They want to know there is a God who cares and loves them. That is the same between the services. The chaplains serve as role models and to share with them not only their hardships, but also the love of God and the hope that comes from a relationship with God. Scot asked what it’s like to be at sea for long periods. Fr. Rock said it’s awesome to see the beauty of God. Being a person of faith, you try to see God everywhere in His creation. At sea, you see the ocean, the clouds, the sunrises and sunsets, and the night sky. Also the animals you find at sea. You get a whole sense of God’s creation. In 1987, he was on an Aegis cruiser coming out of the Persian Gulf through the Straits of Hormuz about midnight. The Captain told him that they would have Mass that night out on the deck between weapons mounts and they jokingly named it St. CIWS of the Sea. It was incredible in terms of the brightness of the stars and the phosphorescence of the ocean so they didn’t need any lights for the Mass. The men and women could sense that God was with them in this place in a very special way. It’s one of his best memories celebrating Mass at sea. 4th segment: Scot asked Fr. Rock what is like to be chaplain in the Far East during his two stints at Okinawa for himself the men interacting in a culture different from our own. Fr. Rock said it’s a blessing for our military to have assignments around the world because they are put in contact with other cultures and they don’t have a choice. When they get there, they can embrace it and go out and discover it, or they just stay on the base. For those that want to learn as much as they can, there’s a richness that opens up for them. Fr. Rock was blessed to have a priest in the local diocese, a Capuchin Franciscan from Wisconsin who’d been there since the 1950s. He was a great mentor to all the priests coming through Okinawa and he gave them a view into the local culture that was very Shinto Buddhist but also connected to the Catholic Church. The more Fr. Rock understood Shinto, it was like reading the Old Testament. He remembers being at a ceremony in a town in northern Okinawa called Nago, for the cherry blossom festival, which is a big celebration for Japan. There was a huge banyan tree in the middle of the city, in front of which was an altar covered with fruits and vegetables and other items, like sake. Of course, Fr. Rock didn’t understand Japanese, so he just had to go on what he saw was happening. But he watched them chant, beat the drum, and dance around, and then take the food on the altar and throw it up into the tree, and then take the big bottles of sake and pour them on the roots of the tree (which disappointed the Marines he was with). Later on the day, one of his chaplain friends who’d been a missionary in Taiwan before becoming a chaplain said to Fr. Rock that’s right out of the Old Testament. Wherever the patriarchs had encountered God in a special way, they would build an altar and offer sacrifice to God in honor of that visit. For the Shinto, in the ceremony they weren’t worshipping the tree, but worshipping the gods as they understood them. What they did know is that because the tree was so big and unique in Okinawa, they believed the gods as they understood them must have touched earth in this particular spot. The Franciscan missionary told him that they were able to use much of the folklore to help the people understand Christianity because of the connections to Christian understanding. The more he traveled in Asia and visited Shinto shrines, he saw the devotion of the people at them and their sense of the divine mystery. They had no understanding of it as we do, but they recognized that there was something beyond them. At these places of worship they would be present while we in the West, without our scientific way of thinking and wanting to figure everything out, have lost a lot of the sense of the sacred and the divine. The biggest difficulty for Christianity in that part of the world is the crucifixion. They can’t understand the humiliation of the cross. Fr. Rock recalls a book that said the way to the Japanese heart is through the compassion of Christ and the stories of Scripture like the Samaritan woman and the the woman with the hemorrhages. Fr. Rock said it enriched the spiritual lives of those from the West who were able to experience it. Scot asked Fr. Rock how often he brings his experiences in the Navy to his preaching at St. Agnes. He replied that it depends on what’s going on. He tries not to tell Navy stories all the time, but there are opportunities to bring his experience to a particular reading. Scot asked him to describe St. Agnes. He said it’s a busy parish with a lot going on. They have had a great foundation of faith-building in the parish. They had Fr. Arthur Flynn as pastor for 33 years and they did a lot of great spiritual development at that time. Fr. Rock wants to go from being a good parish to a great parish and move forward, improving their outreach. That’s one of the big differences from being a chaplain. On a naval base, you take care of the chapel and maintain things for two or three years or maintain the chaplaincy on a ship, and you move on to another assignment. But now Fr. Rock is close to his fourth anniversary at St. Agnes, which is the longest he’s been in one place for the last 25 years. So on the one hand, he could sit back and relax, but on the other, there’s so much that needs to be done working with all the parishioners and growing the parish. Something they’ve took on was the project related to the book, “From Maintenance to Mission,” by Fr. Bob Rivers, to be come a church that is mission-oriented. They started the process a year ago and in October they did the parish-wide survey during the homily at Mass. The surveys were sent to the Center for Applied Research in the Apostolate at Georgetown, who complied the data and put it together in a report. Then they did focus groups which involved about 140 people. In February, they had a listening day at which 175 people came to the church for six hours. They were excited to be able to talk and be heard. Then in March they had a discernment day, trying to narrow down all the ideas of listening day into some practical things they could move forward with. That was another six hour day. They have another one coming up at the beginning of June that they call vision day, to lay out what they will do for the next three years in outreach. It begins a process that is Christ-centered and will be all laid out on Pentecost weekend. Scot said he will have Fr. Rock and some of his parishioners back on the show to talk about this process which could be a model for other parishes. He thanked Fr. Rock for his service to our country and as a priest here in the Archdiocese of Boston. Fr. Rock said Memorial Day is a reminder to us of the sacrifice of all who have gone before us and a good day to remember them, to pray for them, and to thank God for the gifts we have in this country of those who are willingly to go in harm’s way on our behalf.